Our product range includes a wide range of micro filtration assembly with vacuum connection, all glass micro -filtering assembly, micro filtration assembly 90 mm, micro filtering assembly, pipeline filter tube/double drawn and glass sintered micro filtering assembly. As an uprising organization, we manufacture and export a wide array of MICRO FILTRATION ASSEMBLY 47mm WITH VACUUM CONNECTION. All these are manufactured from high grade raw material sourced from a reliable and experienced vendor. These methods are technically advanced and are widely used in chemical laboratories and industries. As an uprising organization, we manufacture and export a wide array of Sintered Glass Micro -Filtering Assembly. All these are manufactured from high grade raw material sourced from a reliable and experienced vendor. 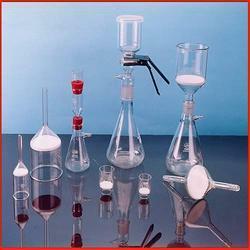 These methods are technically advanced and are widely used in chemical laboratories and industries. Available according to the client’s specifications. Micro Filtering Assembly has membrane support which is considered as its prominent feature. 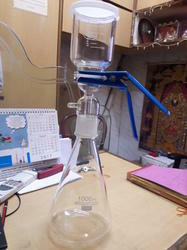 It is long-lasting and in demand because it contains silicon rubber crock\B40 socket and borosilicate flask. It can easily kept anywhere in the laboratory and safe in use. 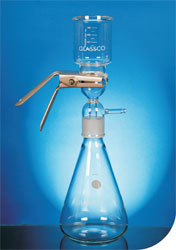 Micro Filtering Assembly contains an integral sealed fritted glass which is designed to maximize flow and reduce foaming. It is available at the reasonable prices. 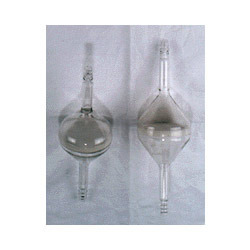 We offer all Glass Sintered Micro Filtering Assembly. With B-40 Joint with socket, with 300 ml cup,with Anodized clamp with neoprene cap. 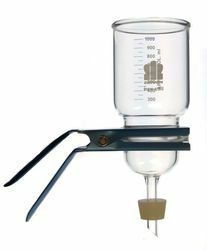 We also make big size, custom made micro filtering assembly.we also supply with with rubber cork directly fitted in filtration flask.the offered assembly is used in different lab application like particle analysis & removal in fluids, culture media, water & beverages, sterilization of tissue & purification. We make sure that all our products are tested against diverse quality parameters before final delivery at clients' end. Clients can avail this assembly from us at most affordable prices. 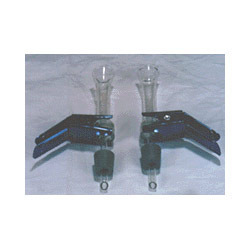 Looking for Micro Filtration Assemblies ?